Canadian Defence Matters has argued in the past that a suitable number of firearms should be purchased as an “interim” measure to deal with a newly discovered capability gap. (One no doubt caused by a previous Conservative government’s mismanagement of the Small Arms Modernization Project). It would appear that this is what is to happen. It has been reported that an Army Interim Pistol (AIP) project which is expected to sustain Army capability for up to 10 years, until the GSP project can plug the entire capability gap resulting from the Brownings’ withdrawal has been initiated. With an approved budget of just under $5 million, taxes included, the AIP project is for the purchase of 4,738 weapons, including 508 for depot retention, all deemed “critical to meet the operational capability requirement of Regular Force units.” But if support for the Reserves, which is one of the stated goals of Canada’s defence plan “Strong Secure Engaged”, is included then this would boost the overall buy to 7,627 once 2,580 are added for the Reserves and 309 for depot inventory. 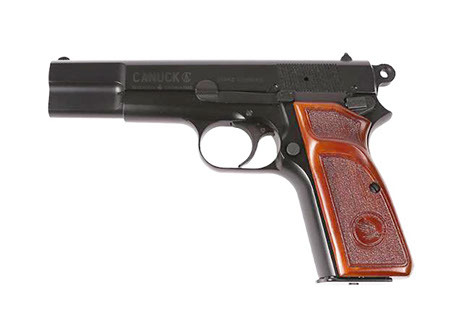 This number would represent about half of the pistols currently allocated to the entire CAF. It is also reported, although no mention of the Army Interim Pistol project can be found on any government website, that it will take two years to complete this purchase. It should also be noted that if the CAF were to purchase 7,627 firearms from a budget of just $5 million then the average cost for each weapon would be about $655.00. This seems unlikely. Perhaps what is necessary if an interim-interim pistol project? Rather than take two years to purchase an indeterminate number of weapons why not take the five million dollars in hand and use it immediately to purchase 5,000 Sig Sauer P320’s (the civilian version of the U.S. Army’s standard sidearm) at commercial rates. These weapons could be used as ‘gap fillers’ until the Army Interim Project can find a weapon to be used until the Small Arms Modernization Project can meet its 2035 deadline. Of course time it is vital that a competition for all aspects of the Small Arms Modernization project should be held, later in the government’s mandate of course. Therefore, to re-enforce the interim nature of these interim weapons, they should be designated as a Provisional Interim Substitute Transitional Ordnance-Limited Service or “P.I.S.T.O.L.S.” in all future discussions. Strong, secure, engaged : Canada's defence policy.